Billedas the first mission to the last planet, NASA's New Horizons spacecraft is inthe final stages of being readied for departure to Pluto. Thespacecraft and its booster, an Atlas V, are now mated. Yet to be attached isthe probe's nuclear power source, followed by hardware electrical connectionchecks. Thecompact and nuclear-powered New Horizons probe is outfitted with sevenscientific instruments, built to take an unprecedented up-close look at Plutoand its moon Charon, map their surface compositions and temperatures, andexamine Pluto's complex atmosphere. Givena liftoff during its first launch window, the spacecraft will arrive at Plutoin the summer of 2015. Afterthe Pluto/Charon flyby, the New Horizons probe--in extended mission mode--is to shootby still-to-be picked Kuiper Belt objects, ancient, icy and rocky mini-worldsthat are leftovers from the formation of the solar system. Thecost of the mission, including the launch vehicle and operations through thePluto-Charon encounter, will be roughly $650 million. Latelast week it was announced that New Horizons was rescheduled for liftoff noearlier than January 17, 2006. That six day slip was called to support additionalinspection of the booster for the Pluto-bound spacecraft, a Lockheed MartinAtlas launch vehicle. The booster-for-hire company experienced problems inSeptember on an updated Atlas propellant tank similar to the one being flown onthe New Horizons mission. Thespacecraft has a 35-day launch window. Last Saturday, New Horizons was moved toLaunch Complex 41 at the Cape Canaveral Air Force Station, Florida. Anintegrated test of the booster now topped by the probe is slated for thisWednesday. New Horizons is the first mission in NASA's New Frontiersprogram of medium-class planetary missions. The spacecraft was designed andbuilt for NASA by the Johns Hopkins University Applied Physics Laboratory (APL)in Laurel, Maryland. Plutois a "treasure trove" of discoveries just waiting to be uncovered, said AndrewDantzler, Director, Solar System Division at NASA Headquarters in Washington, D.C. during a New Horizons press briefing held today. Thefour billion mile voyage of New Horizons is also a four billion year trek backin time, said Alan Stern, New Horizons Principal Investigator from theSouthwest Research Institute (SwRI) in Boulder, Colorado. "Thesuccess of this mission is getting the goods at Pluto and the Kuiper Belt,Stern said. "Our objective is to get off to a good launch and make sure thatthe spacecraft, the entire system, is ready to go. We'll fly it when we'reready...and then we'll make some history." Themessage from Stern is to expect surprises at Pluto. "We've been wrong again andagain by underestimated nature," he said. Inspectionof the Atlas V booster is underway, Dantzler said, stressing that the 35 daylaunch window for New Horizons runs until February 14. "We're being prudent andtaking all measures to make sure it [the booster] is ready. We won't launchuntil it is." "We'rein the final phases of the test campaign preparing for launch," said DavidKusnierkiewicz, New Horizons Mission Systems Engineer at APL. Assumingliftoff during the primary launch window in January 2006, the first 13 monthsof New Horizons mission includes spacecraft and instrument checkouts, sciencesensor calibrations, trajectory correction maneuvers, and rehearsals for aJupiter encounter. NewHorizons will depart Earth's vicinity at a blistering 8 miles per second,passing the orbit of the Moon in just eight hours. "Rememberthat the Apollo astronauts took some three days to cover that distance,"advised GlenFountain, New Horizons Project Manager at APL. At that velocity, the spacecraftwill encounter Jupiter in February 2007, picking up added speed as it zips bythe massive planet. Theplan is to use the Jupiter encounter to test out hardware and procedures forthe later Pluto flyby, 8.5 years later. "It'll be our practice shot for Pluto,"Fountain said. Sternof SwRI said New Horizons will be the eighth mission to Jupiter, filling ingaps of knowledge about the planet's dynamic atmosphere and aurora, magnetosphere,and faint ring. "So it's going to be a busy time." NewHorizons is hauling seven key instruments, said William Gibson, New Horizons SciencePayload Manager for SwRI in San Antonio, Texas. The probe's camera system willbegin relaying detailed images of Pluto about three months prior to closestapproach, he said. "TheNew Horizons payload is the most compact, low-power, high-performance payloadyet to fly on U.S. planetary mission on a first reconnaissance flyby," Gibsonnoted. Thespacecraft is roughly 8 feet (2.5 meters) across and weighs roughly 1,025 pounds(465 kilograms)--about half a ton--when loaded with fuel. APL'sKusnierkiewicz said New Horizons is loaded with redundancy, except for thecraft's singleradioisotope thermoelectric generator, or RTG. "These are highly reliable deviceswhich have many years of experience in space flight," he added. Oncepast Jupiter, en route to Pluto, New Horizons will be put to sleep,Kusnierkiewicz explained. Very few systems onboard are to be active aftercompleting the gravity assist at Jupiter, he said, to conserve the usefuloperating lifetime of electronics. Onthe lengthy trail to Pluto, New Horizons is in "beacon mode"--the firstoperational use of this concept. The spacecraft will broadcast to Earth aonce-a-week overall health report. "Ifany remedial action is needed, the beacon will indicate the necessity for thatand we will respond accordingly," Kusnierkiewicz said. NewHorizons is to churn out imagery of Pluto at closest approach that will be10,000 times better than what can be seen by the Hubble Space Telescope. 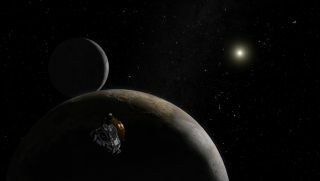 Speedingpast Pluto and Charon, as well as two newly found moons circling the planet--withmore likely to be found--New Horizons heads for the Kuiper Belt objects. That'san extended mission, SwRI's Stern said, depending upon spacecraft health andavailable funds. "Ithas been a long road to get here," Stern said, with launch now just a handfulof days away. "Itwill be like kids in a candy shop" when New Horizons reaches Pluto. "So holdonto your hats."